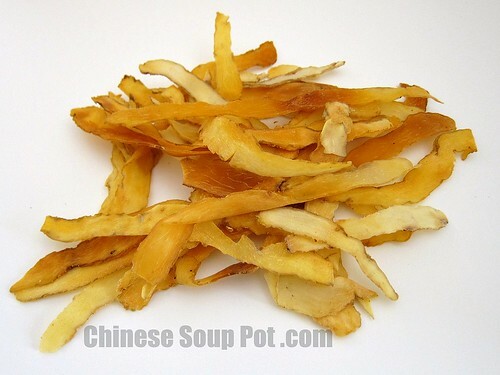 Yu zhu is the dried edible rhizome of a Solomon’s Seal flowering plant that belongs to the lily family. The plant is commonly grown in shaded gardens around the world for its pretty arching stems and hanging white flowers. In nature, the plant grows in the woodlands of China, the Himalayas, Siberia, and Europe. Harvested in autumn, the rhizome is sun dried and sliced for later use. Yu zhu has a light sweet taste, and are naturally yellowish white in color. In China, yu zhu typically comes from provinces like Hebei, Heilongjiang, Henan, Jiangsu, Shandong, and the inner regions of Mongolia. In Korea, this plant is used as a tisane (herbal tea) called dungulle. Yu zhu is used in Chinese herbal soups to relieve dry throat or dry heaty coughs with scanty sticky phelgm due to yin deficiency in the lung. According to traditional Chinese medicine, yu zhu is mildly cooling and nourishes the yin in the lung and stomach. The herb is also known to moisten dryness in the lungs and strengthen the stomach. Yu zhu is commonly used with lady bell root for synergistic effects. Rinse yu zhu in cool water, then soak for 10 minutes. Despite its thin shape, yu zhu requires rather long cook time (2+ hours). Yu zhu can be found in Chinese herbal stores. Choose ones that are soft, long, thick, and yellowish white in color. Good yu zhu should also have a sweet taste. Avoid ones that have been bleached white. Superior quality yu zhu are large, fleshy slices that are semi-transparent. As with all herbs, use in moderation. Overdose may lead to mild nausea, vomiting, or diarrhea. According to traditional Chinese herbology, those with spleen or stomach deficiency, or phlegm-damp should avoid using yu zhu. How do you use your Yu Zhu? Leave a comment below to share your ideas. I love yu zhu, and it’s interesting to read about it’s properties. Great post! My throat has been so dry lately and no amount of tea is making it better. I’m going to look for this the next time I’m at the Asian market! Do you think if I made a big batch of tea/soup with it, it would last in the fridge for a while so I could reheat it when I want to drink some? I really love how much I learn every time I visit your blog. This is another one that’s new one to me. There is a wonderful Chinese store not too far from me that I bet would have a lot of these wonderful ingredients. I’ll have to make a list and look for a few of them next time I’m there! My throat is always so dry in the winter months. I’m going to check Asian market for yu zhu and try it in a soup as you suggested. Thanks!